Continued strong financial results at Harworth Group sees the Rotherham-based regeneration specialists aiming to join the premium segment of the London Stock Exchange. The board believes that this will position the company for potential future admission to the UK FTSE indices. One of South Yorkshire's largest publicly listed companies and was created through the complex restructure of what was UK Coal. A specialist in brownfield regeneration, Harworth, which is based close to its own Waverley development, is one of the largest property and regeneration companies working in the North of England and the Midlands. For the unaudited financial results for the year ending December 31 2017, the company re-categorised £229.1m of property from investment to development. It means that the main metric is now EPRA net asset value (EPRA NAV) which provides a fair value of all the assets and liabilities. Harworth continues to meet its target to grow EPRA NNNAV by at least 10% per annum. EPRA NNNAV per share was up 12.5% for 2017. The reporting changes meant that pre-tax profits were £41.8m, down from £43.4m during the same period in the previous year. The business model is based on reinvesting capital in acquisitions having created capital growth through planning approvals, remediation and development, and generating income through asset management and land sales. Owen Michaelson, chief executive of Harworth, said: "These are another strong set of results where we have again delivered double digit EPRA NNNAV growth, reflecting our continued ability to maximise the value of our portfolio whilst simultaneously growing our strategic landbank and income base through acquisitions and new lettings. "2018 has started strongly, with over 50% of expected full year sales already agreed since the year-end and the completion of three new lettings generating additional recurring income, further demonstrating the success of our proven and robust strategy. This performance, together with the supportive market fundamentals in the areas in which we operate, means we look to the future with confidence." Highlights in the period include progress at Waverley were planning successes and sales and lettings have been achieved. This includes McLaren Automotive taking a 20-year lease on a new 75,000 sq ft unit. In 2018, further signings include British Steel, Bodycote and Spendor Audio. At the end of the year, land deals, worth a total of £11m, were secured with Avant Homes and a new company, Sky House, who will build new houses at Waverley. 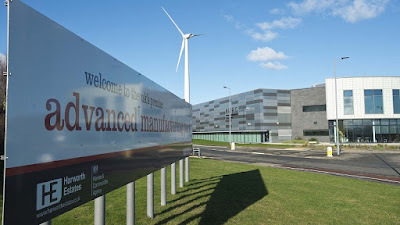 The financial results show that, on the 115 acre Advanced Manufacturing Park (AMP), around 1.2m sq ft of commercial space has been built, just over half way to the 2.1m sq ft of consented space. Plans for the next phases are well underway. On the residential side of the new 454 acre community being created on the site of the former Orgreave coking works, around 800 houses have been built with a further 400 plots sold to developers but not yet built. A total of 3,900 could be built over the next 15 years. A joint venture with Dransfield Properties has secured planning permission for the missing piece of the jigsaw - the £50m retail, office and leisure scheme on 12 acres at the heart of Waverley.